Bring back the legendary 1968 Elvis TV specials with this newly released Wacky Wobbler as he appears in his trademark black leather suit, holding a microphone and making the ladies swoon! 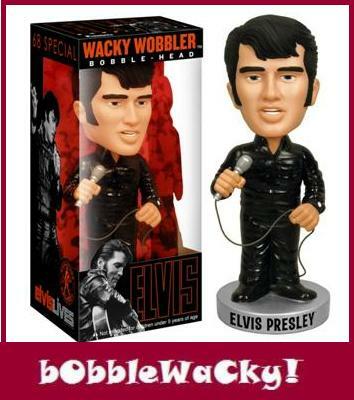 From his Dec. 3, 1968 TV special comes Funko's Wacky Wobbler Bobble-Head tribute to Elvis Presley in a black leather suit and holding a microphone. Ohhhh, Elvis, you're so dreamy. Sob...sob (uh, thang you very much...). The Elvis 68 Special debuted to a huge television audience, resolidifying Elvis" place as the King of Rock 'n Roll. Most memorable were the live jam sessions with many of his original band members playing through a set of classic Elvis tunes and rarities. Clad in his distinct (or should we say extinct?) black leather suit, he charmed the audience with his candor and improvised conversations with his bandmates, recounting legendary stories from his career. After the 68 Special, Elvis would begin his string of record-breaking sell-out performances in Las Vegas and across America cementing himself forever as a Rock 'n Roll icon.